People often go through a physical or metaphorical journey in which they learn about themselves and the world in which they live. Specific archetypes and genres are continually repeated throughout literature and film. Compare/contrast essay on The Odyssey and O’ Brother Where Art Thou? Group oral presentation on real life survival stories. 6. Narrative essay from the perspective of one of characters from The Odyssey. ​In order to understand Homer's The Odyssey fully, you need to know a little about the Trojan War. In literary theory or criticism, "archetype" signifies narrative designs, character types, or images identifiable in a wide variety of works of literature. The similarities within these reflect universal patterns such as death/rebirth. Other archetypal themes are the journey underground, the hero's journey, the heavenly ascent, the search for the father, the paradise-Hades image. Archetypal characters include the rebel-hero, the scapegoat, the earth goddess, and the fatal woman. Does the protagonist undergo any kind of transformation, such as movement from innocence to experience? How does the work reflect the hopes, fears, and expectations of entire cultures (for example, the ancient Greeks)? How do myths attempt to explain the unexplainable: origin of man? Purpose and destiny of human beings? 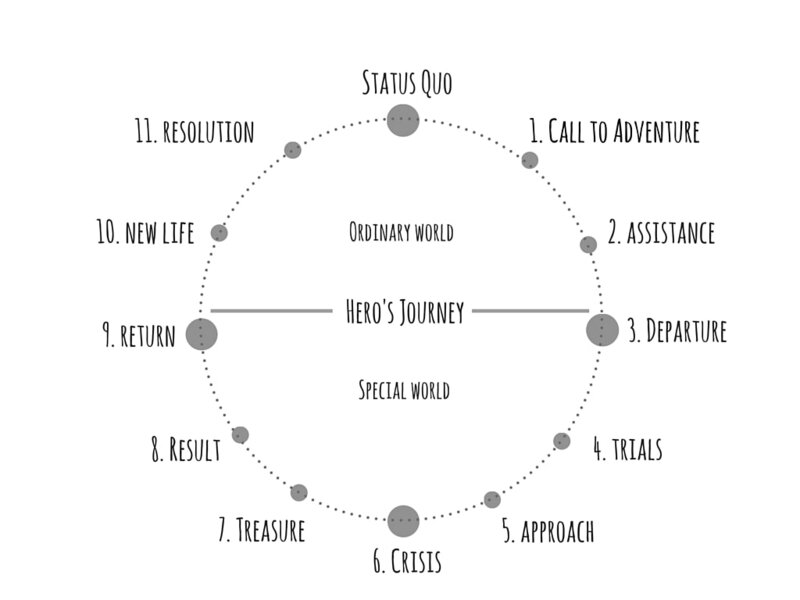 The monomyth, or the hero's journey, is the common template of tales that involve a hero who goes on an adventure, and in a decisive crisis wins a victory, and then comes home changed or transformed.The concept of the Hero's Journey was described by mythologist Joseph Campbell in his book The Hero with a Thousand Faces and later refined to further address issues of gender and culture. Fabulous circumstances surrounding conception, birth, and childhood establish the hero's pedigree, and often constitute their own monomyth cycle. The hero is called to adventure by some external event or messenger. The Hero may accept the call willingly or reluctantly. During the early stages of the journey, the hero will often receive aid from a protective figure. This supernatural helper can take a wide variety of forms, such as a wizard, and old man, a dwarf, a crone, or a fairy godmother. The helper commonly gives the hero a protective amulet or weapon for the journey. 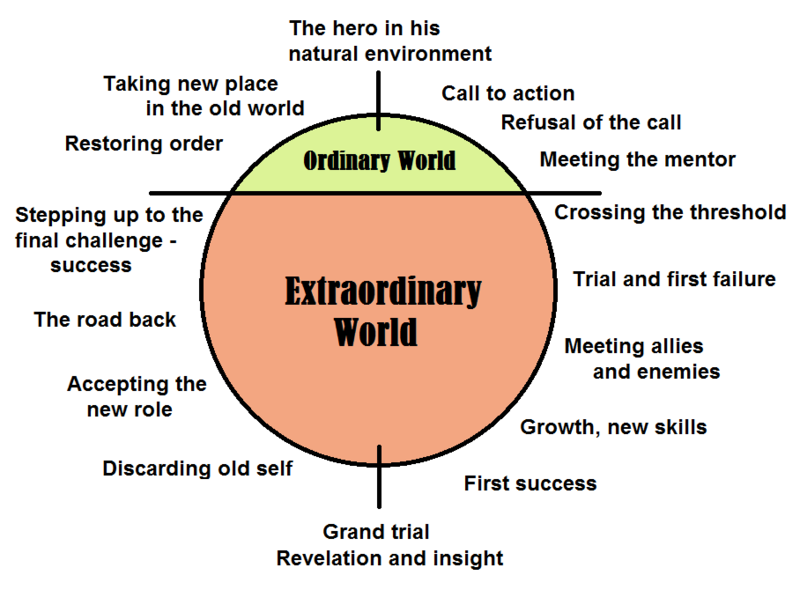 Upon reaching the threshold of adventure, the hero must undergo some sort of ordeal in order to pass from the everyday world into the world of adventure. This trial may be as painless as entering a dark cave or as violent as being swallowed up by a whale. The important feature is the contrast between the familiar world of light and the dark, unknown world of adventure. The hero travels through the dream-like world of adventure where he must undergo a series of tests. These trials are often violent encounters with monsters, sorcerers, warriors, or forces of nature. Each successful test further proves the hero's ability and advances the journey toward its climax. The hero is often accompanied on the journey by a helper who assists in the series of tests and generally serves as a loyal companion. Alternately, the hero may encounter a supernatural helper in the world of adventure who fulfills this function. 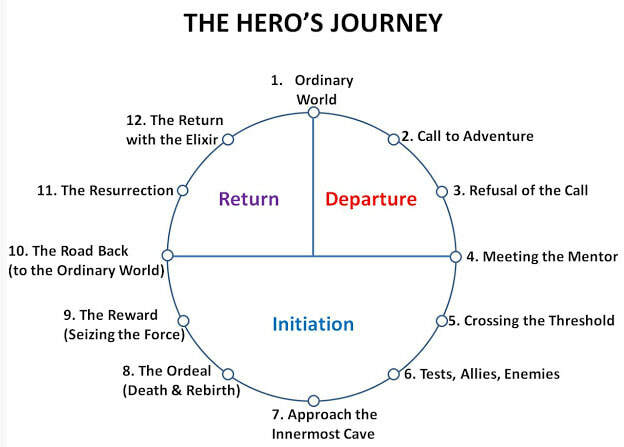 This is the critical moment in the hero's journey in which there is often a final battle with a monster, wizard, or warrior which facilitates the particular resolution of the adventure. After accomplishing the mission, the hero must return to the threshold of adventure and prepare for a return to the everyday world. If the hero has angered the opposing forces by stealing the elixir or killing a powerful monster, the return may take the form of a hasty flight. If the hero has been given the elixir freely, the flight may be a benign stage of the journey. The hero again crosses the threshold of adventure and returns to the everyday world of daylight. The return usually takes the form of an awakening, rebirth, resurrection, or a simple emergence from a cave or forest. Sometimes the hero is pulled out of the adventure world by a force from the daylight world. The object, knowledge, or blessing that the hero acquired during the adventure is now put to use in the everyday world. Often it has a restorative or healing function, but it also serves to define the hero's role in the society. The hero comes back from this mysterious adventure with the power to bestow boons on his fellow man.